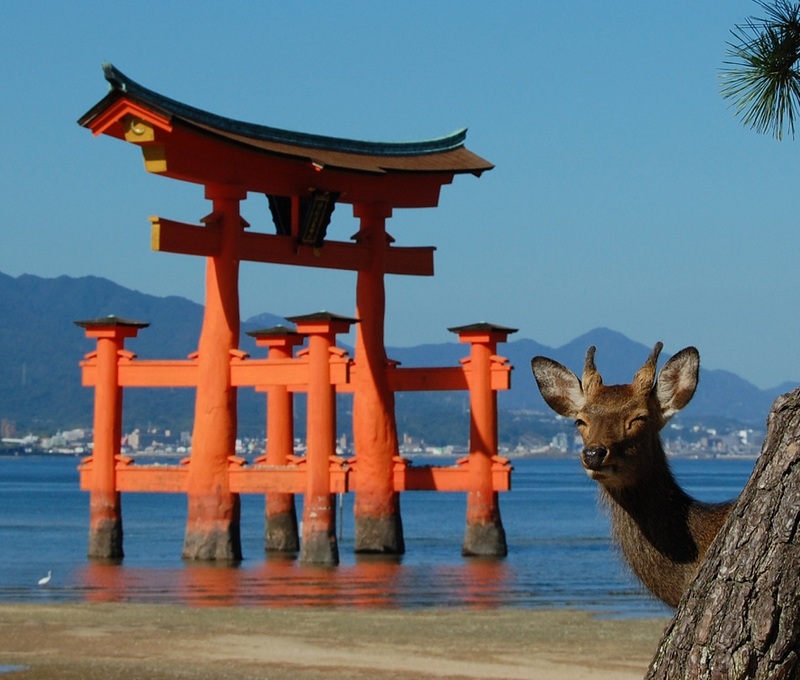 One of the famous "Three Views of Japan", the red torii gate of Itsukushima Shrine in Miyajima, Hiroshima Prefecture is a lasting image. Seeming to float on the water when the tide is high, the bright red torii is 16 meters high, and it is possible to walk to the structure when the tide is low. 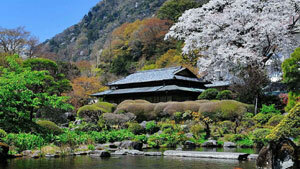 Because of its religious and cultural significance, the shrine has been designated a UNESCO World Heritage Site. 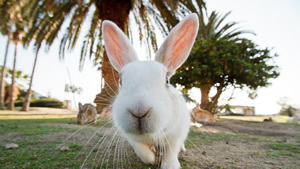 Instructions: Build the foundation of the torii gate with carrots. Using fried, breaded shrimp and fish sausage to make the pillars and crossbeams, which you can make redder with chilli pepper if you like. 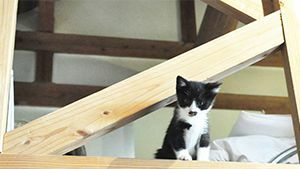 Mimic the roof of the structure with dried nori seaweed. On the opposite side of plate, place a mound of rice. Make two deer on top of the rice using weiners for the bodies and pieces of maitake mushroom for the antlers. 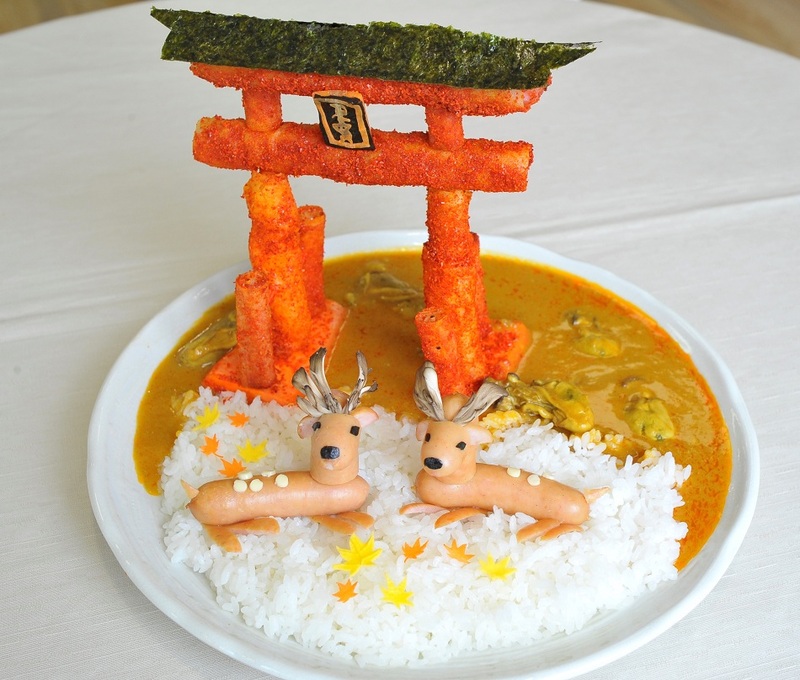 Finally, complete the landscape with a pool of curry on the torii side of the plate, for the illusion of a stately tori floating on the still curry. Mt. 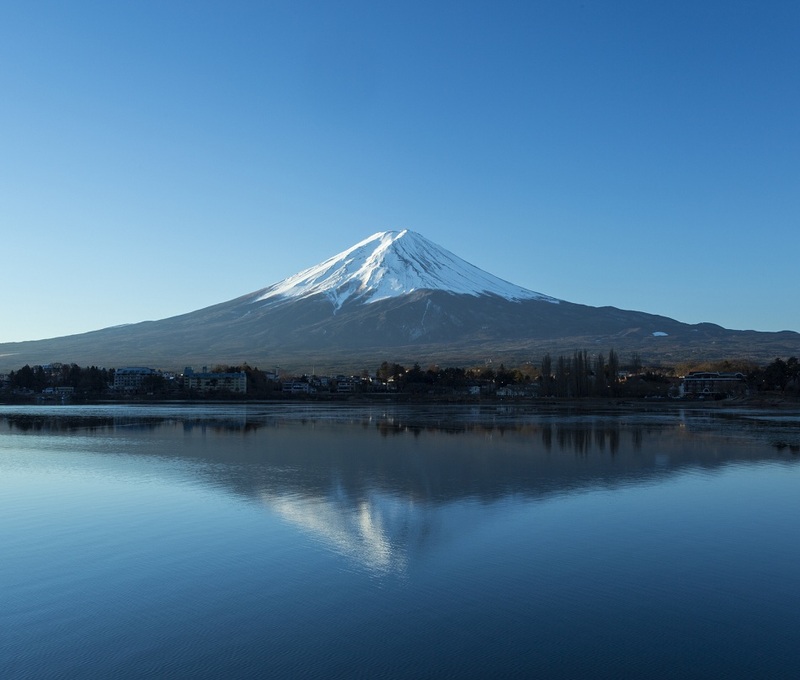 Fuji is undoubtedly one of the Japan's most recognized symbols. The sacred mountain and popular climbing destination was recently made a UNESCO World Heritage Site in 2013. Flanked on either side by Shizuoka and Yamanashi Prefectures, the landscape-dominating and beautifully-symmetric Mt. Fuji is visible across a good part of Japan. Instructions: This curry masterpiece was made with a lot of rice (about 1.5 kg!). 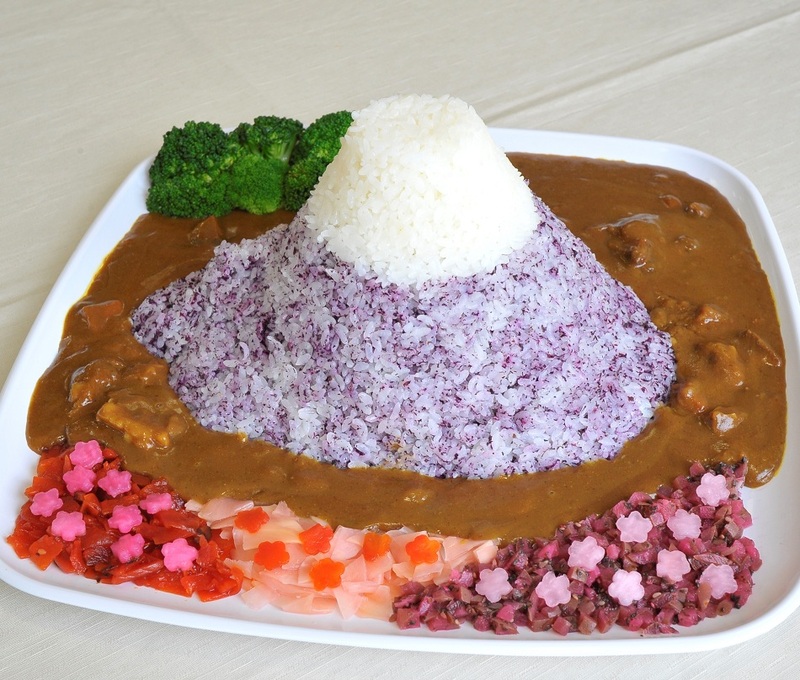 Recreate the symmetrical slopes of the mountain by placing a snowy cap of white rice on top of a heap of mixed-color rice. For the side of Mt. Fuji that's in Yamanashi Prefecture, use red and purple-colored ingredients such as shibazuke pickles, daikon radish dressed with red perilla leaves, and fukujin pickles to imitate the foxgloves. For the Shizuoka Prefecture-side of Mt. Fuji, use broccoli to represent Shizuoka's famous tea fields. On the rest of the plate, pour red wine curry for a savory and aromatic finish. 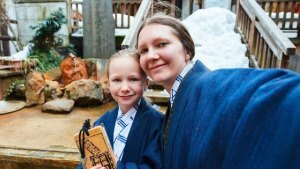 Every year in February, the locals of Yokote City in Akita Prefecture celebrate old traditions during the Kamakura Festival. 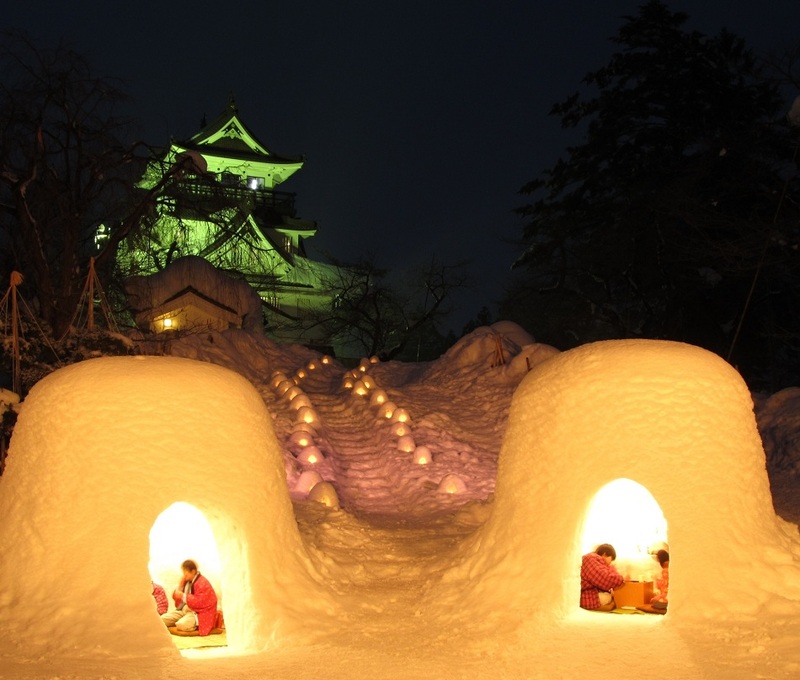 Kamakura are cozy little igloo-like structures built from packed snow. Festival-goers enjoy hanging out in the more than 100 kamakura that pop up around the town during this time. 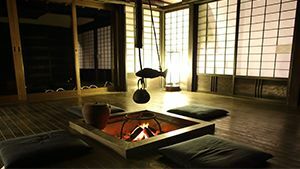 Inside the kamakura, warm drinks and toasty rice cakes are served by friendly townspeople. 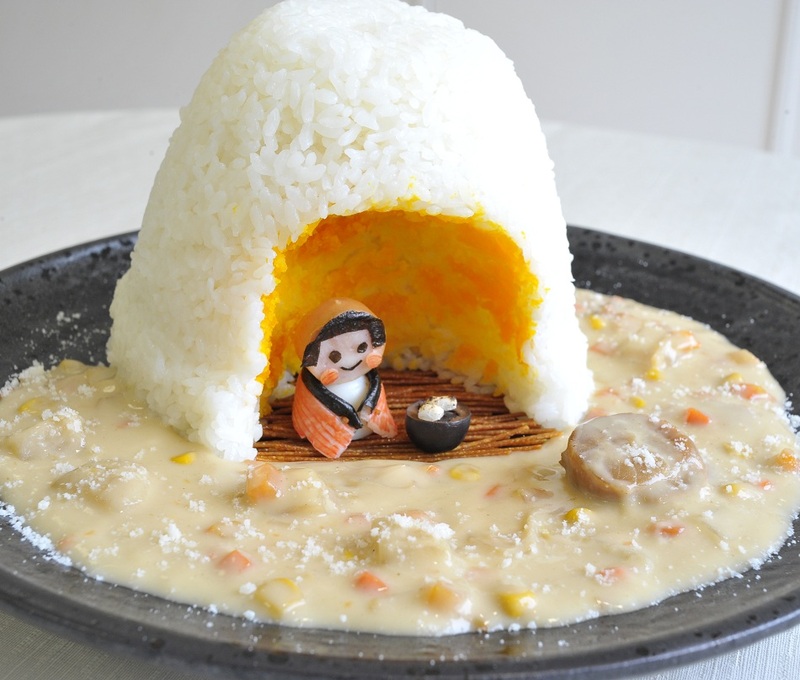 Instructions: To recreate the fun festival atmosphere, place a tall mound of rice on top of a snow-like pool of white curry. 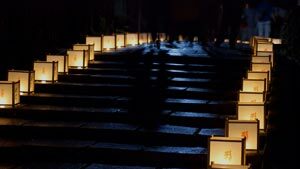 After carving out the kamakura entrance, use the yolk of a hard-boiled egg to recall the glow of a lantern. Beneath the girl made of quail eggs and sausage, place fried pasta to recreate a mat of rushes. Next to the girl, use a black olive as a substitute for a charcoal grill, placing more fried pasta on top of it to create the grill rack. On top of the little grill, place two miniscule mochi rice cakes. Sprinkle the curry with powdered cheese for that freshly-fallen-snow look. 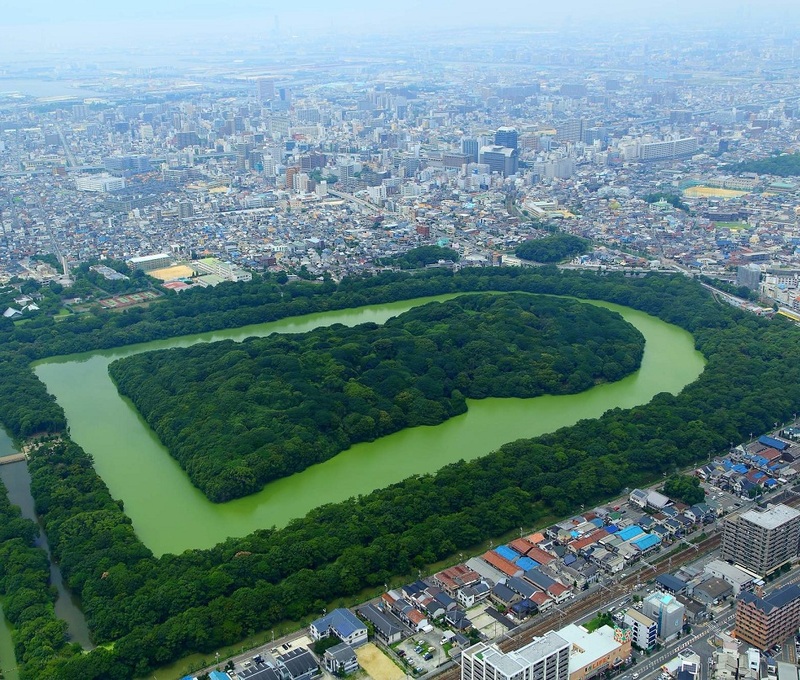 In parts of the Kansai region, such as in Osaka or Nara, these curious keyhole-shaped mounds can be found? What are they? You might be surprised to know the answer. These mounds are a type of kofun, which is an ancient Japanese tumuli (burial mound), and they proliferated in the 3rd to 7th century. The keyhole-shape of the kofun is unique to Japan, and burial in such a splendorous kofun was reserved for the imperial family and the noble elite. Today, kofun sites are popular destinations for their historical significance and their beauty. Despite being ancient burial mounds, it is not uncommon to see people enjoying a picnic nearby! Instructions: To recreate this curry, shape the rice in a circular shape and a triangular shape and join them in the center of the plate. On top, place a cooked patty of ground meat over the circle, and fried horse mackeral (aji, or equivalent) over the triangle. Generously sprinkle the top of these mounds with dried parsley. For the lush green surrounding the kofun, make a paste of cooked spinach and mashed potatoes and pipe it on the edges of the plate. 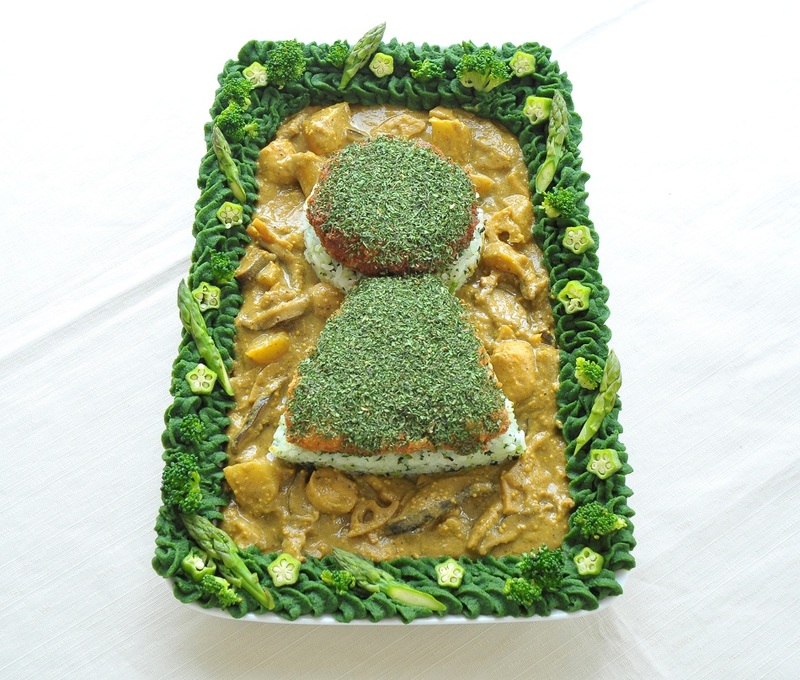 To complete the imagery, fill the moat with curry. Takachiho has its place in the myths and legends of Japan, going back all the way to when the country was founded, according to Japan's oldest historical documents. 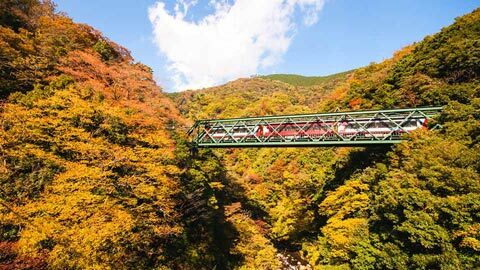 Upon visiting the dramatic, green landscape, it is easy to understand why the Shinto gods and goddesses would be drawn here: it's absolutely breathtaking. 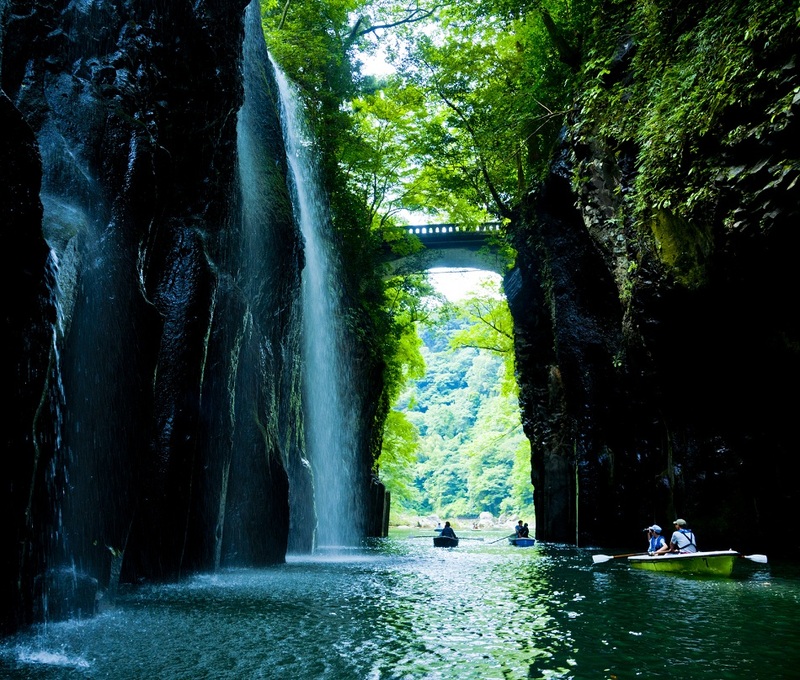 Located in Miyazaki Prefecture, Takachiho Gorge is a V-shaped chasm cut through in the aftermath of an ancient volcanic eruption by the Gokase River winding through it. 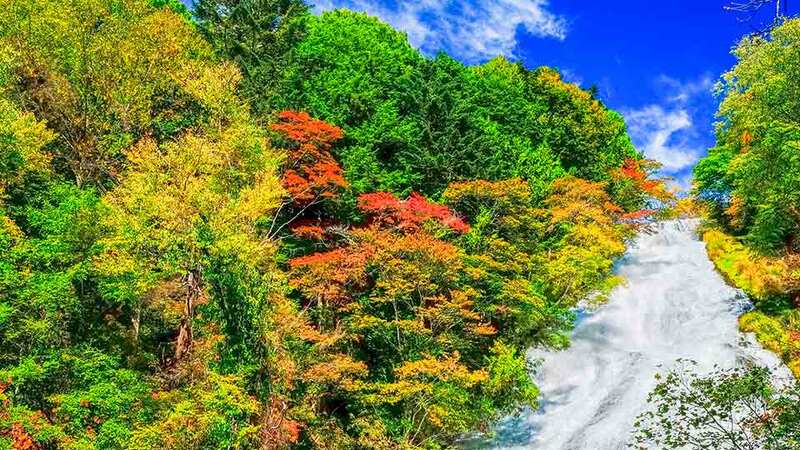 Visitors can take boats through the river and admire nature's work (after all, the area is national natural monument), also featuring one of Japan's most spectacular waterfalls. 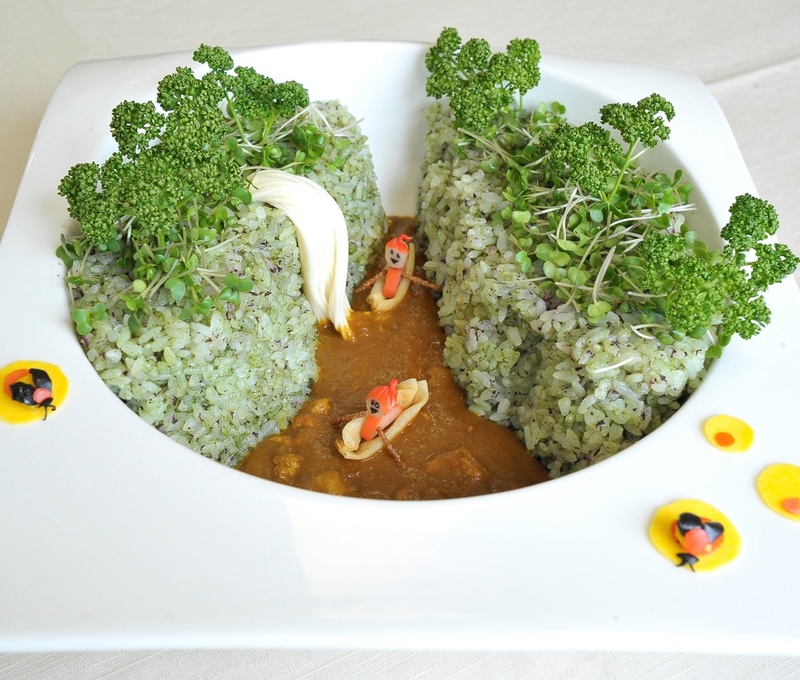 Instructions: To recreate the steep cliffs of the gorge, use rice mixed with green tea or yukari furikake and build two heaping mounds on two sides of the dish, decorate with sprigs of parsley and broccoli florets to mimic the trees. To make the boats, use spring roll wrappers, and make the boaters out of weiners. Don't forget to fill the chasm with some curry to represent the Gokase River. While Japan may be well-known abroad for its sushi and ramen, you might be surprised to learn that for many Japanese, curry ranks high in home-made and restaurant cuisine as a sort of comfort food. 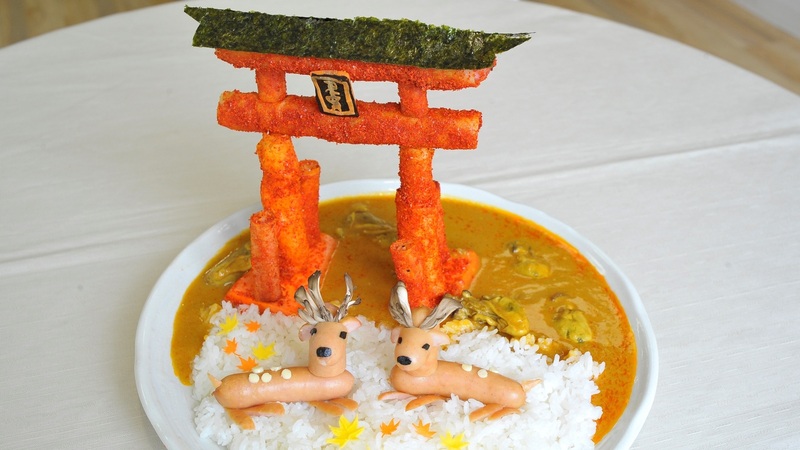 While Indian and Thai curries are also very popular in Japan, it is Japanese curry that holds a special place in the hearts of Japanese everywhere, becoming its own unique phenomenon. Not too spicy but with plenty of savory kick and an undeniable curry flavor, Japanese curry can be found almost anywhere in Japan, and has even found its way into breads and noodle dishes. Each region of Japan has also developed their own takes on the dish, resulting in a wide range of curries that can be found in a Japanese supermarket. Mio Watanabe, a PR food coordinator known in the Japanese media for her inventive and tasty creations, has taken some of these regional curries to make some curry dishes that you at home can make yourself! Check the Asian section of your local grocery store for the ingredients and see if you can recreate some of these iconic Japanese landscapes for a deliciously whimsical meal.